Engagement chicken is a delicious roasted chicken recipe that is so good it will make the man in your life propose. Does it work? Try it and find out! This recipe is said to have inspired proposals among men who eat it. Glamour magazine released a cookbook entitled "100 Recipes Every Woman Should Know: Engagement Chicken and 99 Other Fabulous Dishes to Get You Everything You Want in Life." Now, we know that the way to a man's heart is through his stomach, but we have doubts about this claim. Still, the recipe is very good. Lemon and chicken are natural partners, and this recipe uses a lot of lemons. The juices are delicious drizzled over mashed or smashed potatoes or hot cooked noodles. Serve this recipe with some steamed asparagus and a fresh fruit salad. Recipe reprinted with permission from 100 Recipes Every Woman Should Know by Cindi Leive. Position an oven rack in the upper third of the oven, and preheat the oven to 400 F. Remove the giblets from the chicken and pat the chicken dry with paper towels. Place it breast-side down in a medium roasting pan fitted with a rack, and pour the lemon juice all over the chicken, both inside and out. Season the chicken all over with salt and pepper inside and out. With a fork, prick 2 whole lemons three times each in three different places, and place them deep inside the chicken cavity. Cavity size may vary, so if one lemon is partially sticking out, that’s fine. Put the chicken in the oven, lower the temperature to 350 F, and roast the chicken, uncovered, for 15 minutes. Remove the roasting pan from the oven. Using tongs or two wooden spoons, turn the chicken breast-side up. Insert a meat thermometer into the thigh, and return the chicken to the oven. Roast for about 1 hour to 1 hour and 15 minutes or until the meat thermometer reads 180 F and the juices run clear when the thigh is pricked with a fork. Continue roasting if necessary. 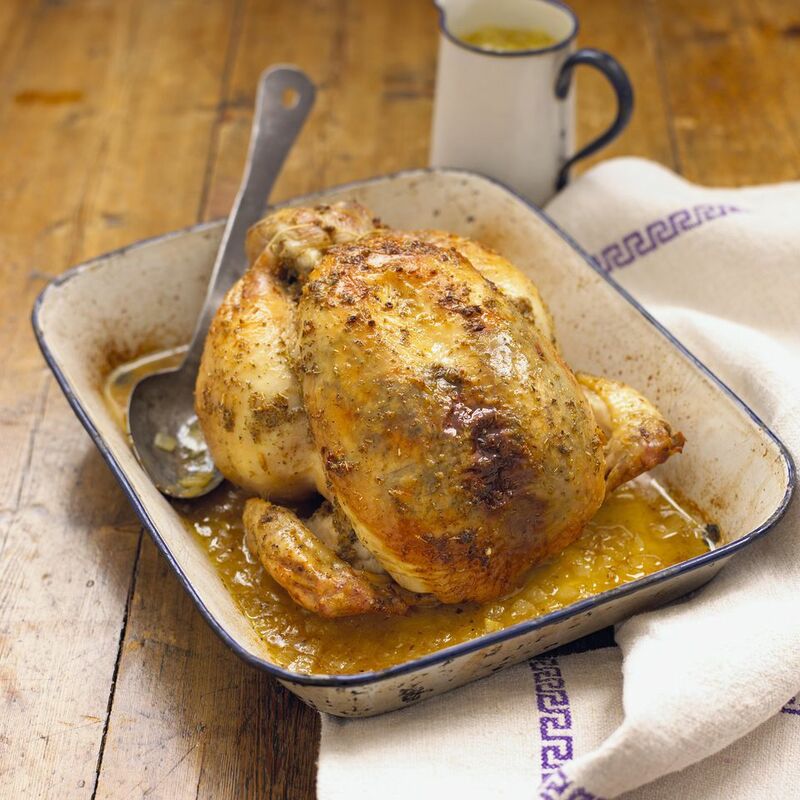 Keep in mind that cooking times vary in different ovens; roasting a chicken at 350 F takes approximately 18 to 20 minutes per pound, plus an additional 15 minutes. Let the chicken rest for 10 minutes before carving. And here’s the secret: Pour the juices from the roasting pan on top of the sliced chicken—this is the “marry me juice.” Garnish with lemon slices and fresh herbs. From 100 Recipes Every Woman Should Know by Cindi Leive and the Editors of Glamour. Copyright © 2011 Conde Nast Publications. Published by Hyperion. Available wherever books are sold. All Rights Reserved. Reprinted with permission.